As you can see from the photo, our Araucanas have begun laying their blue eggs. You may remember from our earlier post that most of our chickens did not begin laying until I explained fried chicken to them. That did not work on the Araucanas and it wasn’t until this week that I figured out why: Araucanas are from Peru and don’t speak English. I don’t speak Quecha but fortunately both the chickens and I could communicate in Spanish. Can you say “fried chicken” in Spanish? 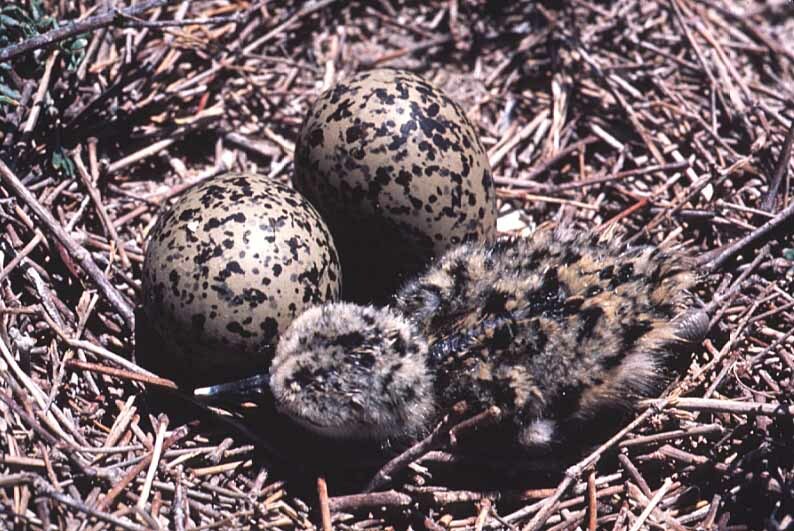 Exhibit B consists of white eggs laid by birds which nest in dark holes such as Petrels, Woodpeckers, Kingfishers. White eggs are easier to see in the dark. Exhibit C brings more white eggs, this time of species which leave nests frequently but cover the eggs with grasses or other plants in the vicinity before leaving which hides the eggs from flying eyes. But there is a hole in this theory and it is the White Leghorn hen, that prolific egg layer we and E.B. White talked about in the first post on egg color. The one who would stop to lay an egg even if she was on the way to a fire. If the purpose of egg color is camouflage to conceal the eggs from predators, who is in more need of that than a domestic chicken whose every egg is stolen from her by two legged mammals? Why does she lay white eggs visible for miles? I think the scientists have a little way to go to finish their explanation. Given what we are learning about bird brains and how evolved they really are, perhaps scientists should take another look at our art hypothesis. We’ll let you know the verdict when it comes in. This entry was posted on October 7, 2007 at 5:30 am and is filed under Avian Reproduction, Ecology. You can follow any responses to this entry through the RSS 2.0 feed. You can leave a response, or trackback from your own site. Without knowing more about where you live and the size of the egg it is hard to help much. If it is as large as a chicken egg, that may well be what it is. If it is smaller, it is a wild bird egg. If you live in an area that Robins frequent, that is a likely suspect. But many other birds lay blue or turquoise eggs. Sorry not to have been of more help. 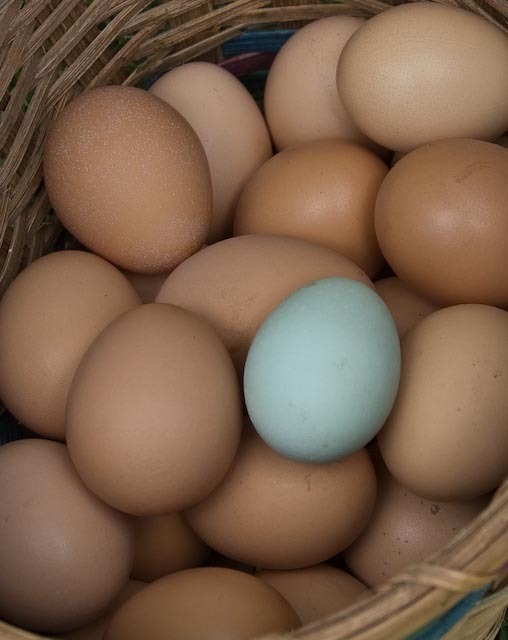 Blue eggs = the ancestors of chickens that lay these came from South America. The Araucana is best known for laying blue eggs. A true Araucana is rumpless, having no tail at all (not even the fleshy part). A modern breed that lays blue eggs is the Ameraucana which does have a tail. i found a nest that is 3 cm big and wide.it has a egg that is 1 cm big and wide.it’s a tiny spotted white and brown egg.what kind of bird may have lade this egg. I have found a very large egg. It’s larger than the palm of my hand and it’s very dark blue with very small lighter blue spots showing throught. It was found next to a pond with a creek running into it in the Western side of central Michigan. The membrane on this egg is also very thick. Would love to know what this is. Any ideas? May I use your beautiful picture of eggs in a power point. The slide has to do with egg allergies. Of course, you may. We grant you a one-time license to use that photo in your power point presentation regarding egg allergies. We r on holiday @ Cape St Fransis in the Eastern Cape South Africa & have found 3 small turquoise eggs with no markings each one by itself in the open on the flat ground in the back yard of the house we r in ~ anyone have any idea what bird it is ~ we also cant leave them there as in the road for us to park our vechicles in the garages.